uttis are surprisingly versatile and can be worn for a whole range of occasions, with a variety of outfits. Be it a crazy night at a wedding sangeet, or a girls’ day out at a dance club or the neighborhood cafe, these footwears hit that sweet spot of panache and comfort. 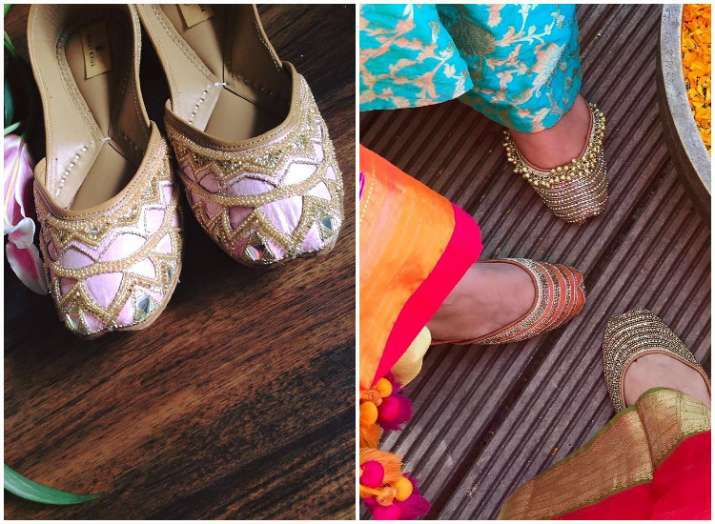 Here, we list down some ways to make your jutti work with your Indian, or western wear. 1. The ethnic look of juttis makes them a natural choice to be paired with an elegant sari along with a classy piece of temple jewelry for that timeless appearance. 2. A jutti with a chic print can make monochrome jumpsuits look even edgier. 3. You can spice up your everyday plain kurta with a bright pair, while the same pair can accompany your favourite pair of jeans or shorts with a tee. 4. Many women have even started teaming up juttis with their work wear, for the flair it brings while feeling snug on the feet. A single pair of juttis, when accessorized smartly, can be the perfect complement to a whole range of outfits, including ethnic and western. (a) Start with the basics. Team up your jeans and white t-shirt with the jutti. You could also throw on a kalamkari scarf to complete the look. (b) Since it’s monsoon time, one style you can never miss out on is classic pencil pants with a top and long overcoat. Throw in a pair of jutti to complete the look. (a) If you play by the rules, short kurtis with denims can be easily paired with a pair of juttis. Find the perfect pair of earrings to match your look and you are good to go. (b) Short skirts in traditional fabrics like ikats and kalamkaris can be pretty much paired with any t-shirts or tops with statement pieces. A pair of juttis would be perfect for overall look.